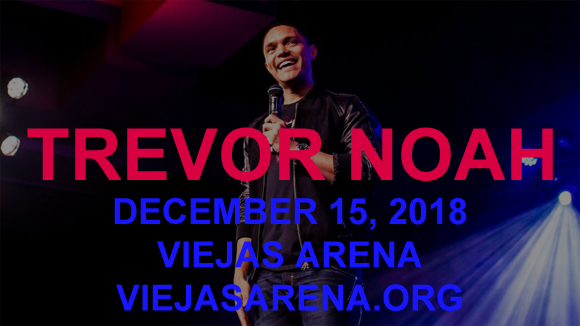 Emmy Award-winning Daily Show host Trevor Noah is bringing his utterly hilarious stand-up comedy to Viejas Arena on Saturday 15th December 2018! Bringing insightful, intelligent, politically-charged musings to the table, the South African comic is as hysterically funny as he is sharp! Currently sold out on five different continents, Noah is one of the most popular comedians in the world, so don't delay – book those tickets now! South African comedian, writer, producer, political commentator, actor, and television host Trevor Noah is currently best known for hosting American late-night talk and news satire television program The Daily Show. Noah began his career in South Africa in the early 2000s as a comedian and television host, touring his comedy and hosting the educational TV programme, Run The Adventure (2004–2006). By the late 2000s, Noah regularly hosted a variety of television shows and was featured as a Strictly Come Dancing contestant in the show's fourth series. Noah went on to host increasingly high profile programmes and events in South Africa, and in 2011made the decision to relocate to the United States. In 2012, he became the first South African stand-up comedian to appear on The Tonight Show, and the following year he became the first to appear on Late Show with David Letterman. Noah's career continued to expand, with appearances on more American talk shows, British panel shows and his own comedy specials. In 2014, he became the Senior International Correspondent for The Daily Show, and in 2015 he succeeded long-time host Jon Stewart. Noah's 2016 autobiographical comedy book Born a Crime garnered critical acclaim, and in 2018 he was named by Time magazine as one of the 100 most influential people in the world.